Baron von Brunk's Website! » IDDQD: God Mode Activated! 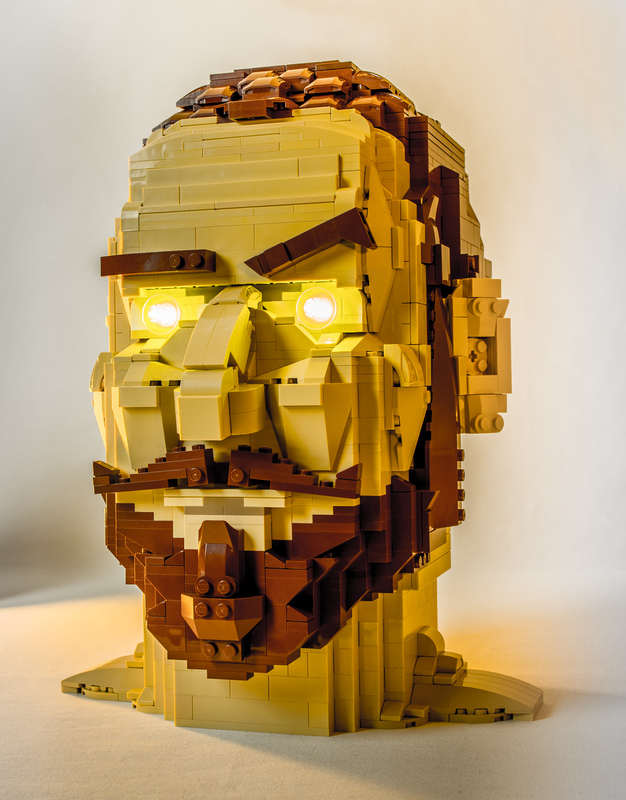 Inside the cranium of my LEGO head sculpture is a homemade circuit board with an Arduino code to control dual white LEDs — which can illuminate independently or simultaneously. The irises can be removed and color-swapped, thus glowing with a variety of colors with transparent LEGO pieces! The inner circuit is powered by 3 AAA batteries, and the code is programmed into an Atmel ATtiny85 soldered onto a small PCB. The Arduino code allows a series of LED functions which are all controlled by a single button. Example, one tap of the button makes the left eye glow while the right eye stays off; two taps will make the left eye blink rapidly with the right eye off; seven taps of the button makes both eyes glow simultaneously, et cetera.